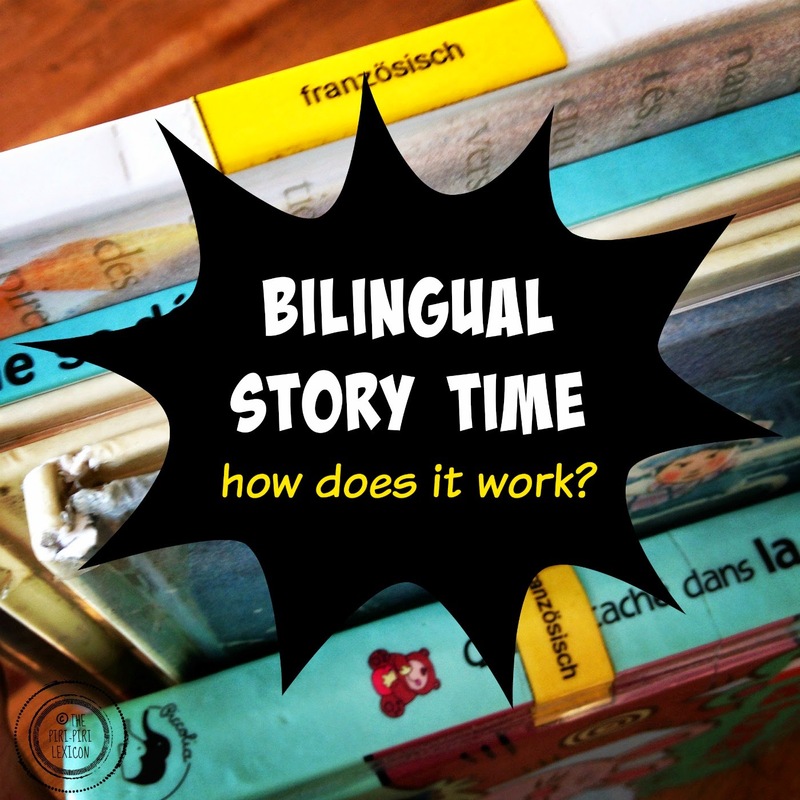 Bilingual story time: how does it work? My daughter attends a story time hour at a local American library twice a month. For her, this is one of the only opportunities she has to hear other children speak English on a regular basis. The stories are read by a lovely American lady and they usually do a craft or a game after the stories. LJ, 4, loves it. 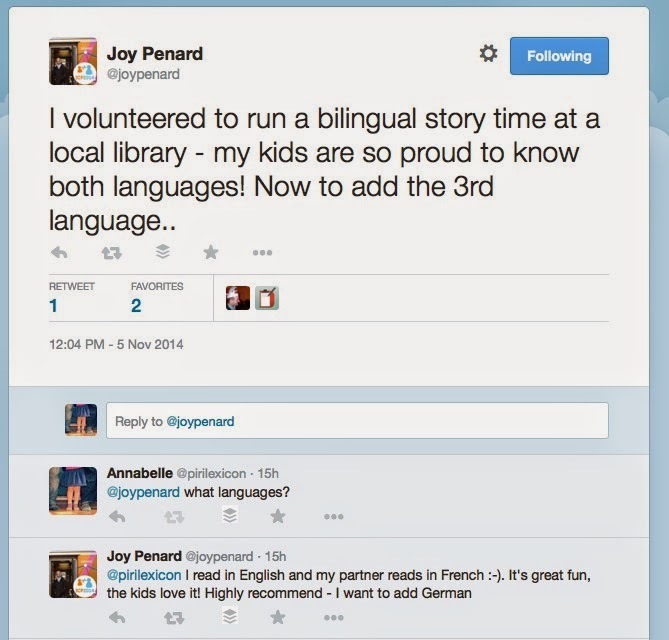 A few days ago, I came across a tweet by Joy Pénard about holding a story time in two languages. I thought it was an interesting idea and Joy was kind enough to answer my questions. So, read on if you want to find out more. Who are you? And how did you come about to running this story time? My name is Joy Pénard and I am an American speech therapist. My family and I moved to the Alsace region about a year ago and as bilingualism/multilingualism is very important to me, I immediately considered the idea of offering a bilingual story time as I had loved the idea on MultilingualLiving.com. I suggested the idea to the local library, and the response was positive. At the moment, it is an English/French endeavor, but as this area is also very close to Germany (and Switzerland) I hope that one day German may become a part of the bilingual story time as well. In addition, advocating for other languages is a possibility – there are many languages in the surrounding community. How old are the children? And what is their linguistic background? We aim the books for children aged 4-7 years. Here in the community, most are French speakers, often with another language at home: German, Turkish, Spanish, English, Arabic, and other languages – it's quite an international area. How often and for how long do you read? We currently meet about once a month, though it could be more or less often as a schedule permits. The story time lasts about 30-45 minutes. Do you do it alone? It is a partnership – there are two people – I hold and read the book in English, and my partner holds and reads the book in French. There are several formats; the easiest is: I read a page in English, then my partner reads the French version. That way, any child not speaking one or the other language has the book/images to follow and then hears both languages. How do you select the books to read? Honestly, we try to use books the library already has, that are available in both languages – and preferably the same versions. This past story time, we had “Misery Moo”/”Madame Meuh” by Jeanne Willis, and next time we plan to do “Where the Wild Things Are”/”Max et les Maximonstres” by Maurice Sendak. There is a list of bilingual (English/French) books on the multilingualliving.com website where there is also a video that demonstrates a bit how a session goes. How do you find the quality of the bilingual books? The quality of translations seems to vary, so it is wonderful to talk to as many people as possible about well-loved books – which are more likely to be great in both/several languages. Have you ever thought of just making your own translations? I am not a translator, so I find it very time-consuming to attempt a translation, even for a short children's book. I prefer to leave that to the professionals, but I suppose if I found a book I really adored and felt capable of writing a good translation myself, I might attempt it. Have you encountered any cultural differences between you and the other reader? How have you overcome them? Actually, my partner is also American, though, like me, fluent in French. We both appreciate lively presentation of the books, changing voices for the different characters, not being afraid to be a little silly, which the kids love. We try out a few different ideas and compromise if there is a difference of opinion – it is for fun, after all! Do you do anything else apart from reading stories? (talk, play, sing, etc)Yes! We read 2 or 3 stories, and we do a bit of talking, and plan several songs, in both languages – finger play/action songs between the stories. How interactive are the sessions? Right now, the kids do not seem anxious to interact (ie answer questions about the story) but they do attempt to imitate the actions to the songs – in both languages (I give explanations of the lyrics in English if necessary), and they show an interest, so I'll take that! What do you find the most challenging about reading those books? I love it! I guess if something is challenging, it might be convincing often mono-lingual parents that this does not in any way hinder a child's language development, and furthermore encourages bilingualism, a wonderful asset! Is there anything you do that doesn’t work and wish to change? I am quite happy with the flow of the session at the moment. This is still a new project for me, so I'm not sure yet, though I will say that I definitely would include the songs – the kids seem to really enjoy them. I think reading books that are really favorites is a good idea, too. Sometimes I think our tendency as adults is to think the kids won't want to hear the same story they know again, but actually, I think they are more likely to join in and enjoy a book when they know the story. It becomes about sharing the enjoyment with those around them. You plan on introducing another language and making it a trilingual story time or another set of bilingual? I think for the age-range we have targeted, trying to include three languages for each page of a book would be too long, so a different bilingual combination might be better: French/German, for instance, in addition to our current French/English. I would just like to add that the most surprising aspect for me was the obvious pride my own two girls showed, because they understand both English and French. I think this kind of event brings a real value to being bilingual and would encourage this activity as an avenue for meeting other bilingual families to support the ongoing path of bilingualism. I love this idea and would love to set something like this up in one of our local libraries. Books are such a great way to get kids into languages and it's so helpful that you can find popular titles in many different languages. I've found it hard finding a good range of bilingual books so will definitely be checking out that site. Good quality bilingual books are hard to come by in my opinion. Let us know if you find some good ones. I do bilingual storytime at our elementary school. I've blogged about it fairly often. It's English and Japanese. This is so nice to see! When I asked multilingual living if I could write about bilingual storytime, I was hoping it would inspire others to do just that! Thanks for sharing Joy! Here in Lille, we are entering our 6th year of bilingual storytime at the public library. We even have school groups come in once in a while! It's a lot of fun! Thank you so much for your comment. I love the idea that school kids come to it too. What a wonderful event to organize! My kids are in 1st and 2nd grade and still love story time in Spanish and/or English, but we have never attended a story time in both languages!